Want to learn how to build a recognition program that recruits and retains the best talent? This free guide will teach you how to design your recognition and rewards program and get executive buy-in. 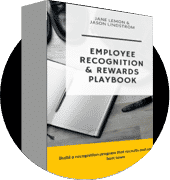 Request the Employee Recognition and Rewards Playbook below. In a competitive and evolving business climate, the best organizations constantly seek ways to recruit and retain the kind of employees that give them a successful edge. But if you don’t have the resources of Apple or Google at your disposal, how can your company adapt their strategies so you can win the war for talent? It was once said, “Employees come first. If you take care of your employees, they will take care of your clients,” quoted by the founder of Virgin Group Ltd, Richard Branson. CEOs and managers recognize a problem where employees are unhappy and want to leave the company. In an attempt to keep their most talented workers happy, managers and CEOs are thinking of fun ways to thank their employees. They give them Starbucks gift cards, hand out cash prizes, discount codes, coupons and more. The real question is, what do employees actually want? Companies are starting to recognize the importance of corporate culture and how it has an affect on company performance. Many people know the significance of corporate culture, but how is it done? What are the factors and trends that influence how corporate culture is being built? In our interview with Damon Klotz, he shares his ideas on best practices and insight on the topic. Why is it so hard to engage millennials? The employee turnover ratio is worsening year by year and the job of a manager is getting more and more tough. Not only are they responsible for scoping and acquiring the best talent, they are also responsible for making sure workers are happy and that employee turnover rates are as low as possible.